Just when we think it is not possible to come up with another great idea in the backpacking, emergency preparedness arena another company surprises us. 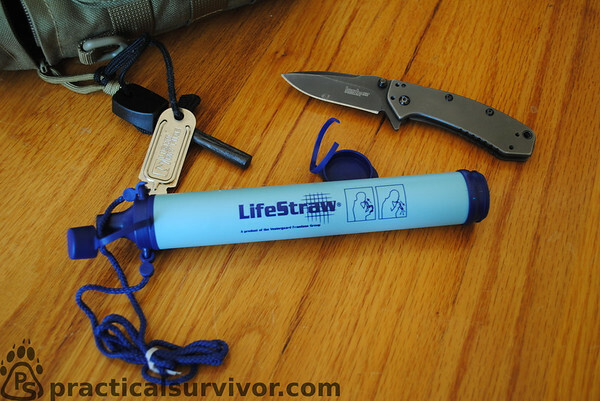 Sawyer is a manufacturer of outdoor products such as first aid kits, sunscreens, insect repellents and water filters. We have tested the permethrin insect repellent for warmer month hunting trips and it works very well. It can be sprayed on clothing and backpacking gear. 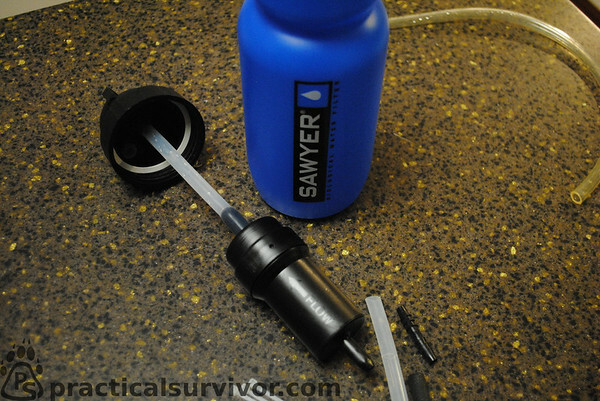 This time we are testing the Just Drink Water Treatment Bottle by Sawyer. The water bottle system's many configuration options caught our eye. Clean water is always a priority. 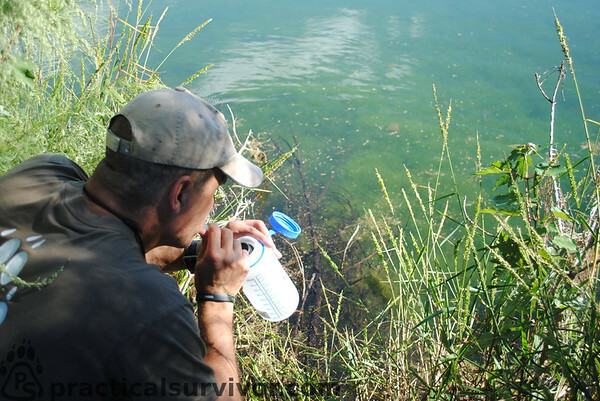 Whether backpacking or in an emergency survival situation water is going to quickly take precedence. Depending on the temperature and level of activity, only a few hours without fluids can begin to cloud our judgement. We cover the symptoms of dehydration in several articles. Lets also discuss the versatility and usefulness of this bottle from a backpackers perspective. There are a lot of competitors in the water filtration arena so what makes this system different. First we will cover the bottle's specifications and follow with the different configurations. 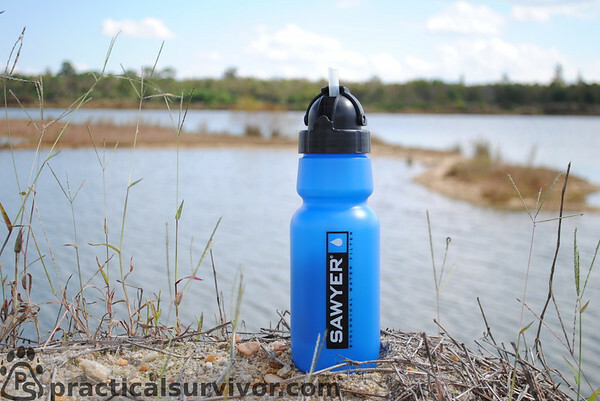 Whether the plan is to carry the bottle for camping or having it as a backup filtration system for your family, we believe Sawyer is likely to catch your eye. Enough said lets take the bottle for a spin in the woods. The micron rating for a water filter is an attempt to quantify the ability of the filter to remove contaminants of a particular size. The physical pore size traps larger particles as they pass through the ceramic filter hopefully removing the harmful pathogens. So by filtering down to 0.1 micron the filter should remove Giardia, Crypto, E.coli and some viruses. Depending on the traveled environment it may be a good idea to add chemical purification tablets such as Potable Aqua's Chlorine Dioxide pills Below we provide a sample chart. Does it remove chemicals or heavy metals? Likely the most common configuration since it is sold as a water bottle filtration system. The filter attaches to the inside of the lid. Sawyer provides the hose pieces. On the filter the hose is pre-attached. Three pre-cut pieces are provided as the straw. The lid design folds the straw within it when not in use. 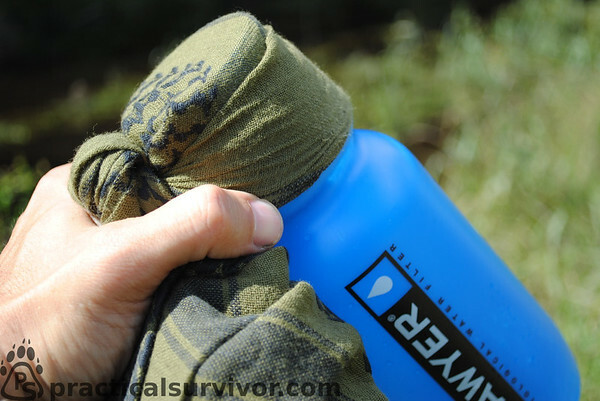 A very solid design that allows us to simply gather water on the move. 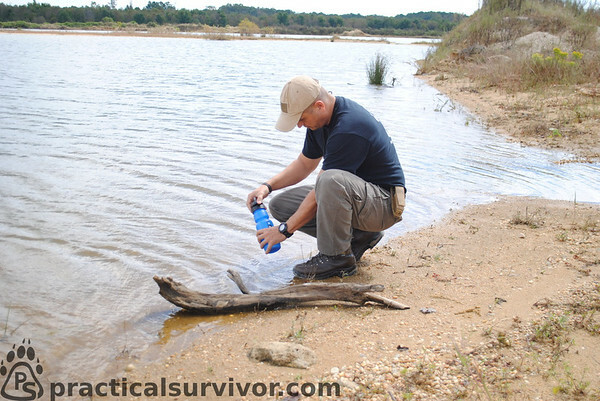 The advantage of the bottle is we do not have to remain near a water supply. By hydrating fully and taking a full bottle we can continue traveling. We tested the bottle in water of different clarity. The filter did not clog while drinking water with high suspended solid matter or silt. Swamp water is usually high with tannin in our area. We found that the water did not have a tannin taste after filtration. 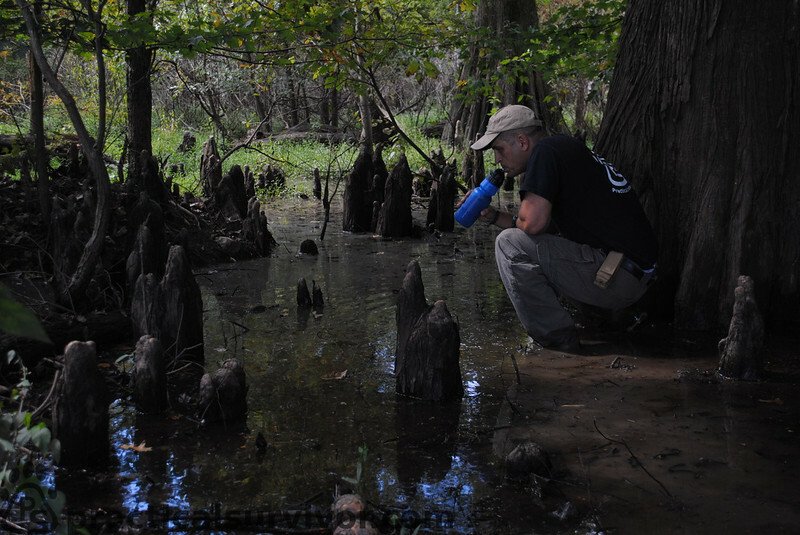 When filtering water with a high level of sediments and area, we prefer to pre-filter the water using a bandana of shemagh. The material allows us to strain the water removing the larger Seeping the water through the shemagh we immediately improved the quality and likely extend the life of the filter. Below we twist a corner of the shemagh to the bottle and make a slight indentation. Admittedly this slows the inward flow of water into the bottle adding to the time you spend next to the water. Always be mindful of wildlife in your area and the possible dangers of leaning while putting your hand in the water. In our area there is a high snake population so we usually use a walking stick to clear and check the area. Some people have to deal with alligators and crocodiles. 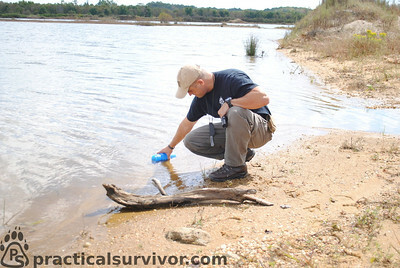 Setting up a parachute cord tether to your bottle would be one possible solution. 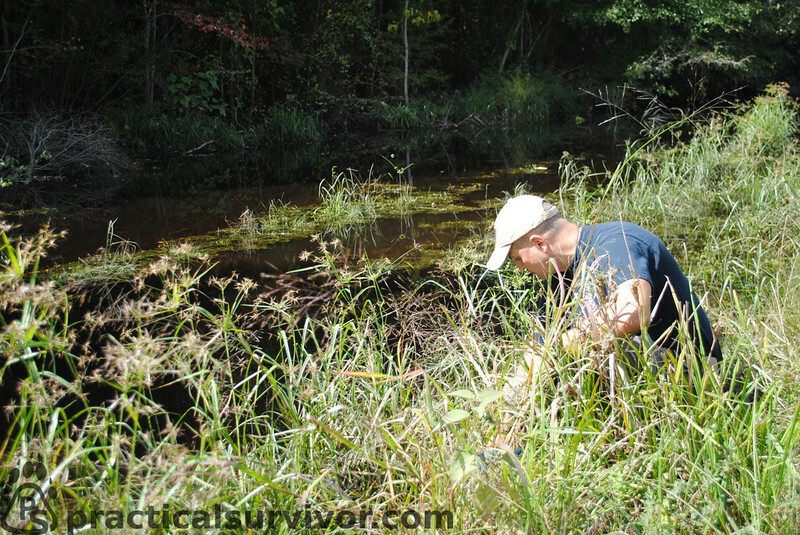 This also applies when collecting water in colder temperatures. There are times that avoiding the edge of the water just makes sense. In case you are wondering what the water looked like without using the shemagh pre-filter. The filter alone handle this water just fine. 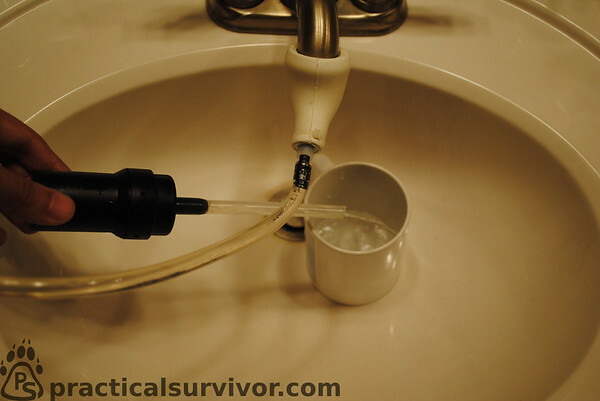 A lighter option is to carry just the filter with a hose attached and use it as a straw. 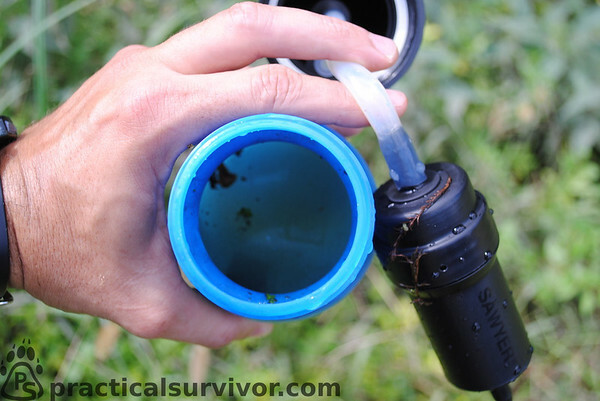 If carrying any other type of water bottle or bladder, the filter "straw" configuration can be inserted into the unclean water and used to drink directly from the source. 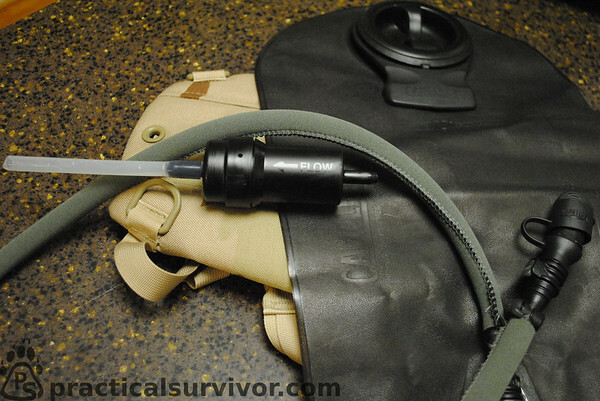 The filter can be added in-line to a camelbak type water bladder. In reality it can be configured in-line to anything that has a hose attachment from a bucket to a flexible water bag. The hose would need to be cut and the filter can be inserted into the ends of the hose. Small cable ties (tie straps) and pieces of tubing are included in the kit to assist with this configuration. 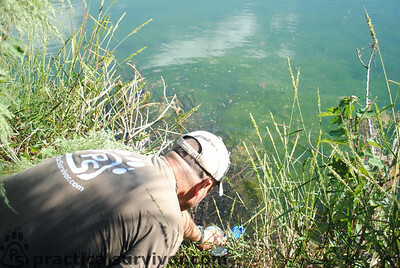 The water bladder can be filled with the unclean water and filtered as needed. This can be a great time saver for a backpacker and also avoid the need to boil the water during drought no fire conditions. The faucet adapter is particularly interesting as it opens up the idea of having a bottle per family member in the house for emergency situations. During earthquakes, hurricanes and other natural disasters the water supply can be contaminated. Even if the city water is running, it can be deemed unsafe to drink. The many options provided by this comparatively inexpensive kit is one of the alluring qualities of the product. 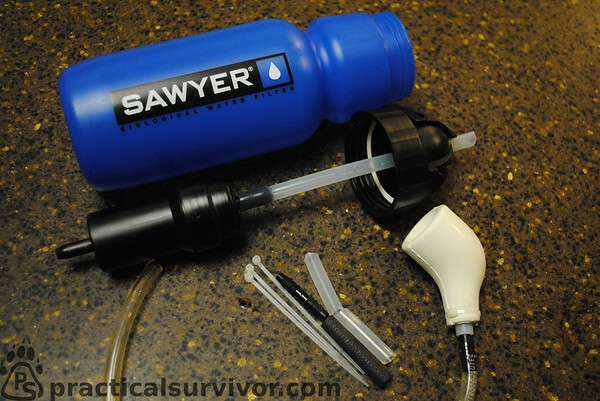 We must say Sawyer thought this through and ensured that people with different interests will consider purchasing the Sawyer Water Filtration Bottle and look at their many products. This filter system opens up many options that would normally require multiple filter systems to cover. 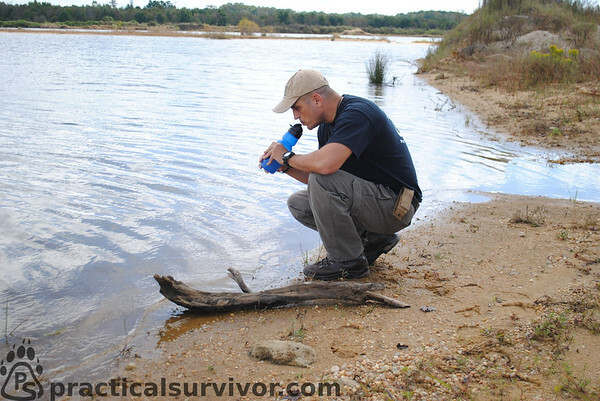 The bottles can be carried as a backpackers water filtration system. If traveling on vacation or business to another country. Clearly it is a good item to have in RVs, campers, automobile, boats, planes and yes even your get home bag. A few dollars spent now can help avoid at minimal discomfort in some cases worse. Whether you choose to get this system or a different brand, having multiple ways to purify water is a wise decision. 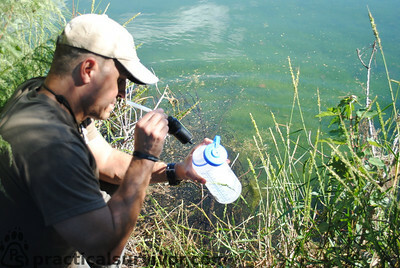 We will continue to test the bottle and filter in different configurations and add our findings to the article. Remember as we always say, practice with your gear now, do not wait until it is an emergency to attempt to familiarize yourself under stress. Don't be paranoid, be prepared.